We are looking forward to welcoming you to what should be a remarkable late-night event in the Britten Studio this Saturday 14 June, 10pm. 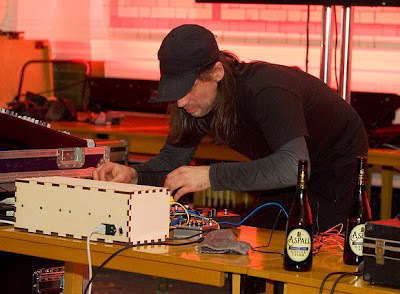 This will feature contrasts between quiet, unamplified performance and, as befits the title of the event, intermittently loud electronic sound. EXAUDI will sing Brumel’s Mass unamplified. In between the movements sound artist Russell Haswell has produced electronic interjections which, by way of dramatic contrast, are very loud, harking back to the origin of the piece. During these amplified sections some audience members may wish to use earplugs, which will be provided. Our experience is that this will help comfort levels without diminishing the dramatic impact of the performance. That email arrived today from the Aldeburgh Festival, and sound artist Russell Haswell is seen above. Good to see classical music has not lost its aura at Aldeburgh. And good to see such an imaginative exploration of the middle way between tradition and innovation. If the provision of earplugs doesn't attract a new audience, I don't know what will. Is classical music's next big opportunity the Earthquake Mass market? Also on Facebook and Twitter. Photo via flickr. Any copyrighted material on these pages is included as "fair use", for the purpose of study, review or critical analysis only, and will be removed at the request of copyright owner(s). In my view psychoacoustics hold the key to the future of classical music, and it is good to see Russell Haswell, EXAUDI and the Aldeburgh Festival exploring this discipline.